Since we stopped making the Marquis we have been inundated by requests for its reinstatement. So that's what we've done. This is a new Marquis salmon reel in sizes one, two and three, built to the original design. We've made the new reels and spools interchangeable with all the originals because we know exactly what happens. Over the years, a frame gets dropped, buckled or broken. You still have the spools and the lines that you love but without a new reel frame, they're useless. Not now. You're back in business. The new reels are all manufactured from high-grade aluminium with the polished silver rim style that everyone agrees is the Marquis at its best. This isn't quite the original Marquis though. Because we can't resist improving things we've slightly redesigned the internal cam to give an increased range to the click-check. The original “Taupo” Perfect fly reel was introduced in 1958 to fill the need for a larger capacity trout reel to handle the legendary monster Rainbows and Browns of New Zealand. 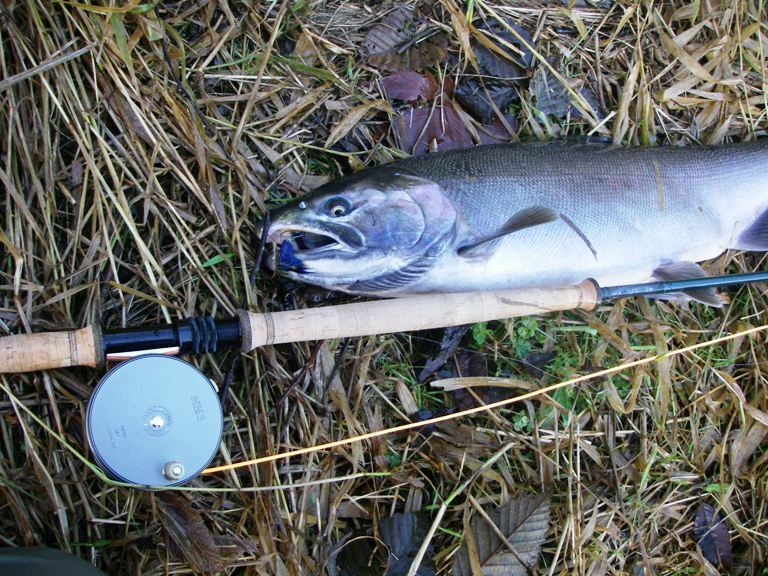 Despite a relatively short production life of only four years, the “Taupo” was eagerly sought after as a Steelhead, Light Salmon, and large Trout reel. Continued demand for this classic reel inspired Hardy to reintroduce the “Taupo” for 2011. While all the dimensions and aesthetics are true to the original, we have made a couple of improvements. The new “Taupo” is machined from solid bar stock aluminum and hard anodized for strength and durability. This construction also does away with the need for a line guard, which was an option on the 1958 – 1962 reels. The check mechanism has been changed from the MK II to the more modern Lightweight style, which enables the angler to change from Left to Right hand retrieve at will. While maintaining the looks, feel, and spirit of it ancestor, the new “Taupo” is a stronger and more functional successor a Hardy classic. Balances very,very well on the 12'6" to 11'' spey rods. Landed this silver on it. The Rod is the 12'8" 8wt CF Burkheimer and the reel is the Hardy Taupo reel loaded with the SA 520 Skagit Extreme head with integrated tip. The Zenith series of rods uses the amazing properties of Hardy & Greys SINTRIX material in an ultra-advanced, four-section design to produce a range of rods that are user-friendly yet high performance. SINTRIX rods have an incredible strength to weight ratio and come fitted with titanium line guide and superb skeletal reel seat. Eleven rods in sizes from an 8ft 4 weight to 10ft 8 weight. SINTRIX - up to a 60% increase in compressive strength. Stunning Hardy designed two part skeletal reel seat. “In our last 5-weight shoot, it was just by a nose. This time it wasn't even close! The Zenith surprised us all when it swept every single performance category, blowing everyone else away! Hardy Lightweight reels are out of stock. Spools still available! The four models in the range - the Flyweight, the Featherweight, the LRH Lightweight, and the 2010 addition Princess Reel - have been used by discerning anglers for over half a century. And with our new sensational range of Lightweight rods to accompany them, these reels become even more attractive.